Klik på billedet og se alle billeder fra Cabañas Lucero del Bosque. Set within 13 km of Cerro Catedral Ski Resort in San Carlos de Bariloche, Cabañas Lucero del Bosque provides accommodation with a flat-screen TV. Free WiFi is provided. The units have a fully equipped kitchen with an oven and a microwave. There is a seating and a dining area in all units. Civic Centre is 18 km from Cabañas Lucero del Bosque. 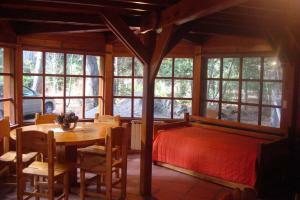 The nearest airport is San Carlos De Bariloche Airport, 29 km from Cabañas Lucero del Bosque. Guests will be asked to provide a valid ID. Please note the based on local tax laws, all Argentinian citizens and resident foreigners must pay an additional fee (VAT) of 21%. Only foreigners who pay with a foreign credit card, debit card or via bank transfer are exempt from this 21% additional fee (VAT) in accommodation and breakfast when presenting a foreign passport or a foreign ID along with a supporting document handed by the national migrations authority, if applicable. Please inform Cabañas Lucero del Bosque in advance of your expected arrival time. You can use the Special Requests box when booking, or contact the property directly with the contact details provided in your confirmation.